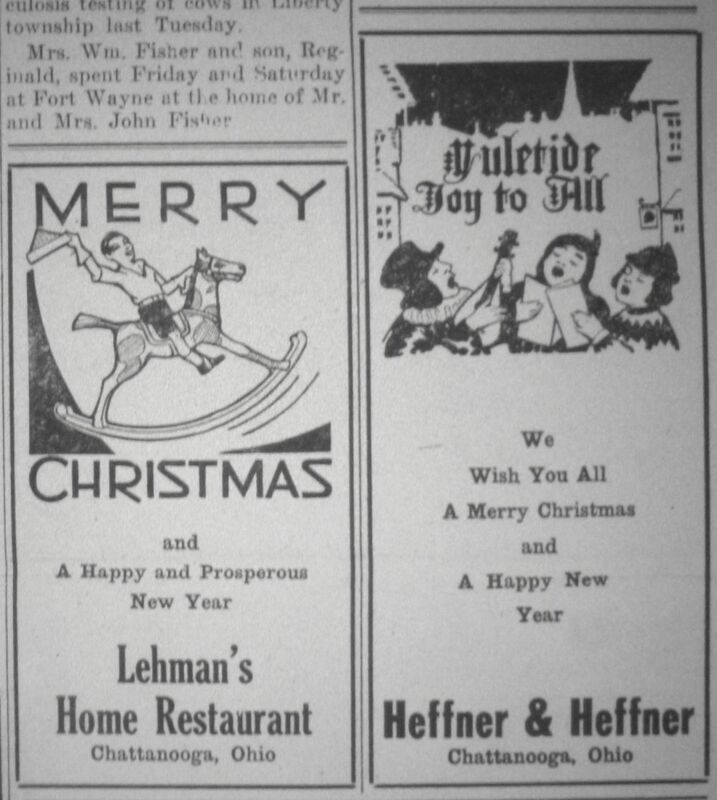 Heffner & Heffner Grocery, Andrews Garage, Lehman’s Home Restaurant, Egger’s Grocery, Dr. Metcalf, Johnson’s Garage, Smith & Sons Hardware, Wendel’s Motor Sales, Schroeder’s Barber Shop, Vining Stock Yard,. Do any of these businesses sound familiar? They were business establishments in Chattanooga, Ohio, back in 1933. 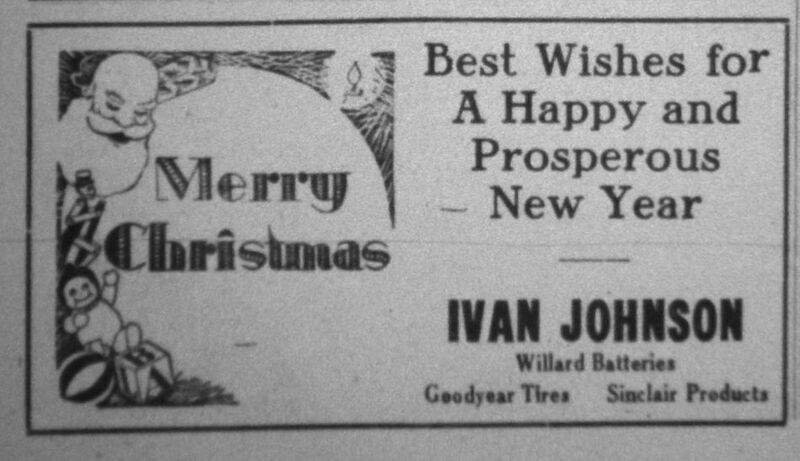 They all had advertisements and Christmas greetings in the 1933 Christmas edition of The Willshire Herald. 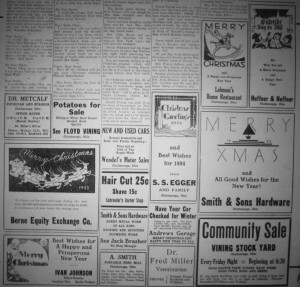 Last week I posted some Dear Santa letters from some Chatt residents, printed in that same 1933 Christmas newspaper. 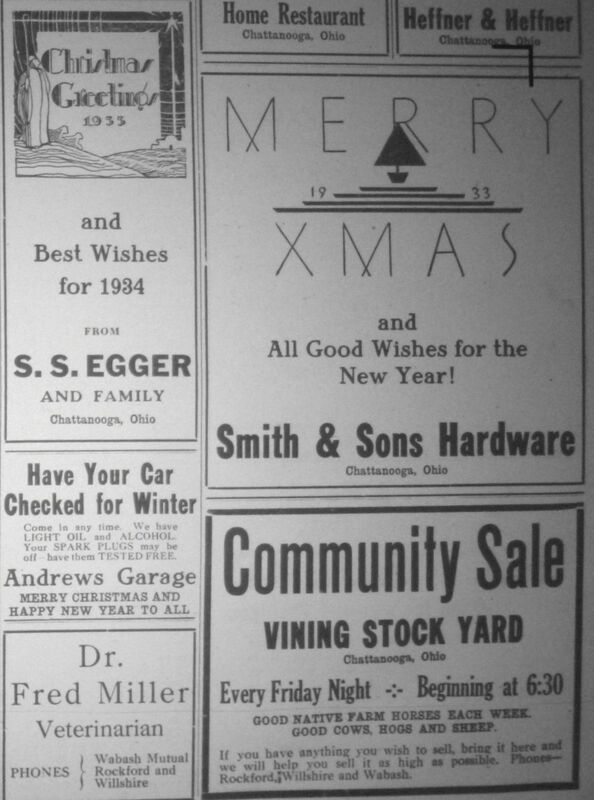 This week we’ll take a look those Chattanooga business ads and Christmas greetings. 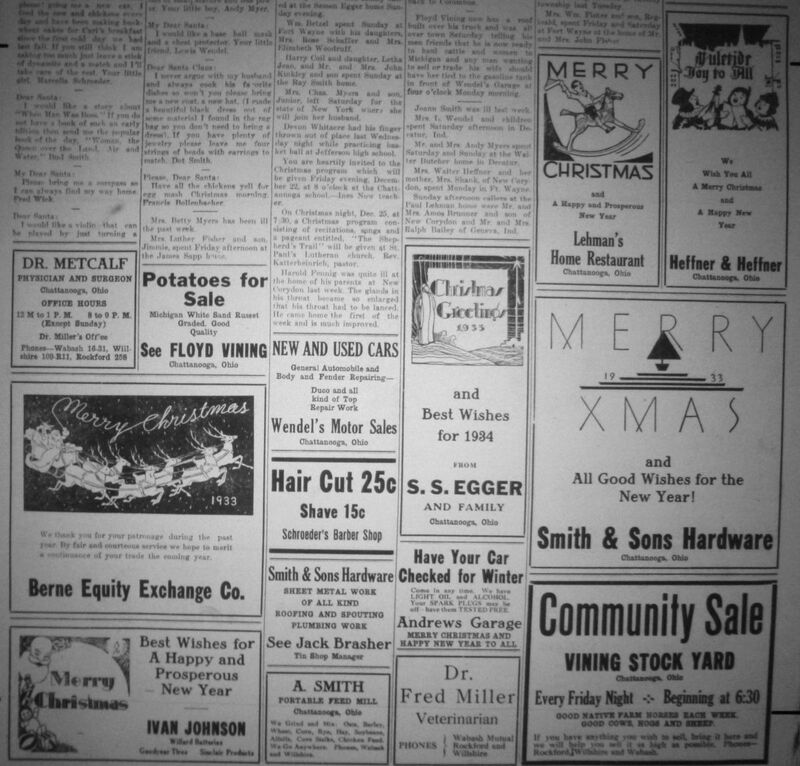 1933 Christmas edition, Willshire Herald. 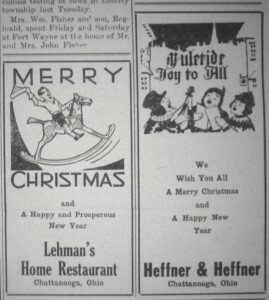 Lehman’s Home Restaurant. Could there be a connection to Barney Lehman, the former owner of the current Chatt Bar & Restaurant? Next to it was an ad for Heffner & Heffner, which I assume was Heffner’s Grocery. 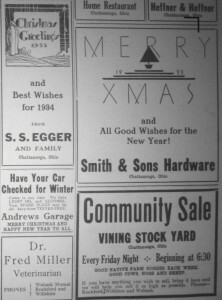 Christmas Greetings, 1933, and Best Wishes for 1934 from S.S. Egger and family, Chattanooga, Ohio. Egger Grocery was south of the Chatt Bar. In his building was a grocery, the post office and the undertaker. Andrews Garage: Have your car checked for winter. Come in any time. We have light oil and alcohol. Your spark plugs may be off–have them tested free. Merry Christmas and Happy New Year to all. Dr. Fred Miller Veterinarian, Phones: Wabash Mutual, Rockford and Willshire. Merry Christmas and All Good Wishes for the New Year from Smith & Sons Hardware, Chattanooga, Ohio. Vining Stock Yard advertised a Community Sale every Friday night beginning at 6:30: Good native farm horses each week. Good cows, hogs and sheep. If you have anything you wish to sell, bring it here and we will help you sell it as high as possible. Phones–Rockford, Willshire and Wabash. Wendel’s Motor Sales: New and used cars. General automobile and body and fender repairing–Duco and all kind of top repair work. Carl Schroeder offered a hair cut for 25 cents and a shave for 15 cents at his barber shop. Smith & Sons Hardware had a second ad: Sheet metal work of all kind, roofing and spouting, plumbing work, Jack Brasher, Tin Shop Manager. At A. Smith’s portable feed mill: We grind and mix: oats, barley, wheat, corn, rye, hay, soybeans, alfalfa, corn stalks, chicken feed; We go anywhere. Phones, Wabash and Willshire. Chatt had a physician and surgeon in 1933: Dr. Metcalf, Physician and surgeon. 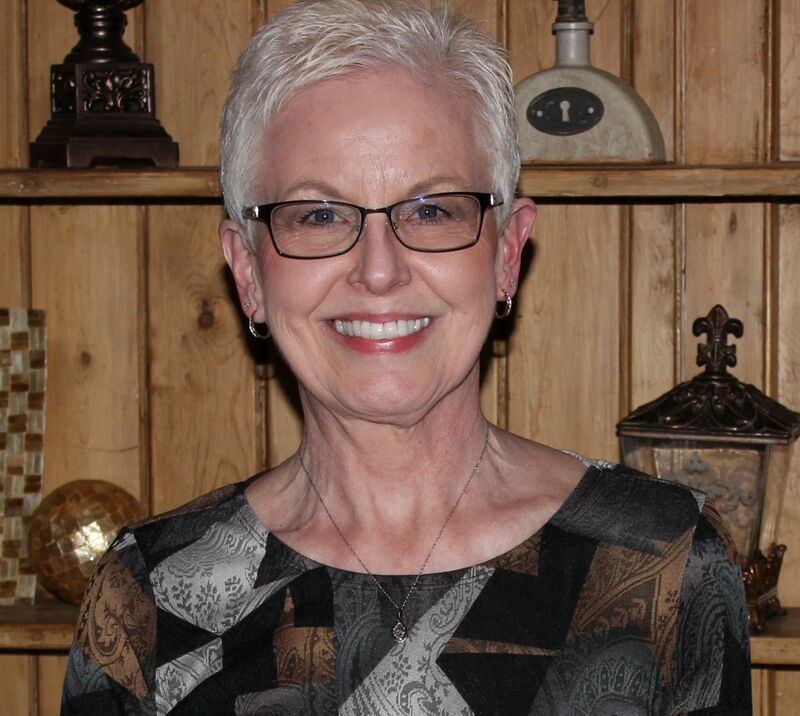 Office hours 12 M to 1 p.m., 8 to 9 p.m. (Except Sunday), Dr. Miller’s Office. Phones– Wabash 16-31, Willshire 109-R11, Rockford 258. Floyd Vining had graded, good quality, Michigan white sand russet potatoes for sale. Merry Christmas and Best Wishes for A Happy and Prosperous New Year from Ivan Johnson. He sold Willard batteries, Goodyear tires, and Sinclair Products at his garage. Yes, Chatt was a thriving community in 1933 and these ads give us a good idea of the businesses and services offered in the village. 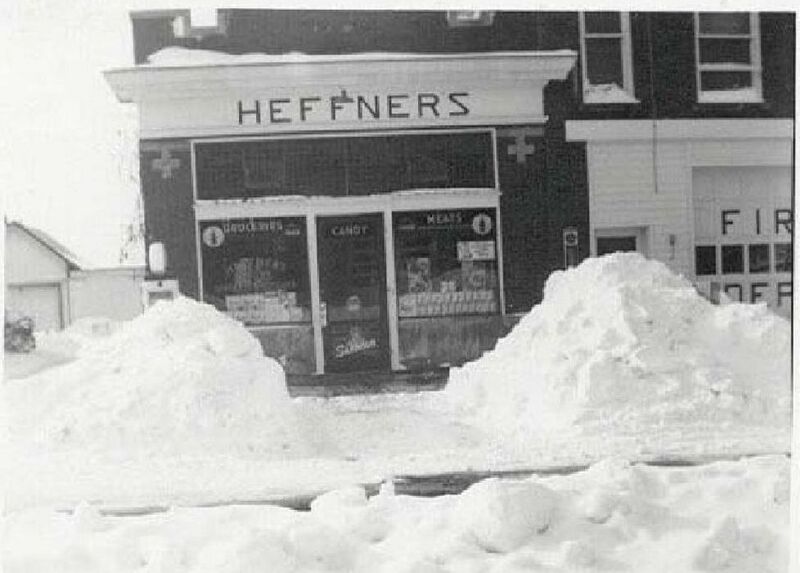 Apparently it was a white Christmas that year (assuming the picture of Heffner’s Grocery was taken near the Christmas date for the paper). In fact that is an impressive pile of snow on either side of the entrance door, especially given that it was likely shoveled by hand. Doesn’t look like much was done to the street. Automobile traffic was probably still rather light in 1933. While the store clearly has the name Heffner the picture certainly looks like the store did as Bollenbacher’s grocery in the years to follow, even the direct proximity to the Fire House next door (or attached, depending how you want to say it). What a great flashback! I do not know when the Heffner store photo was taken, but it was probably taken after 1933.